For this post I explored the townland of Castlereagh in County Down. Which wasn’t where I expected it to be. 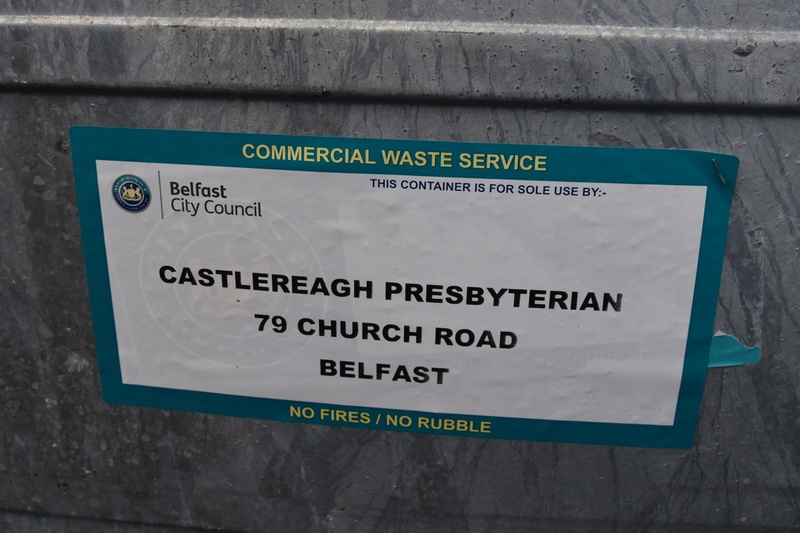 I had assumed that it would be somewhere along Belfast’s Castlereagh Road, but no, I had to climb out of the city, driving uphill along Ballygowan Road and Church Road, to find the townland of Castlereagh. Then I had to go back five hundred years to find out why the townland of Castlereagh was so important. In the late 16th century, the O’Neill family occupied a castle on this hill, and owned huge stretches of land in County Down. Their grey castle – in Irish An Caisleán Riabhach – gave its name to the townland. The grey castle no longer exists, but its name is remembered in this street. By 1616 the O’Neill estates had been broken up and sold, with Castlereagh surviving only as the name of the townland and the name of one of the baronies of County Down. In 1795 Castlereagh became the name of a person, when the title of Viscount Castlereagh was created for Robert Stewart, son of the 1st Marquess of Londonderry. On his father’s death Stewart became the 2nd Marquess, but is better known today as Lord Castlereagh, a politician who served as Chief Secretary for Ireland from 1798 to 1801, Secretary of State for War and the Colonies from 1807 to 1809, and then Foreign Secretary from 1812 to 1822. In 1810 the Australian Governor Lachlan Macquarie gave the name Castlereagh to a street in Sydney, in honour of Lord Castlereagh. 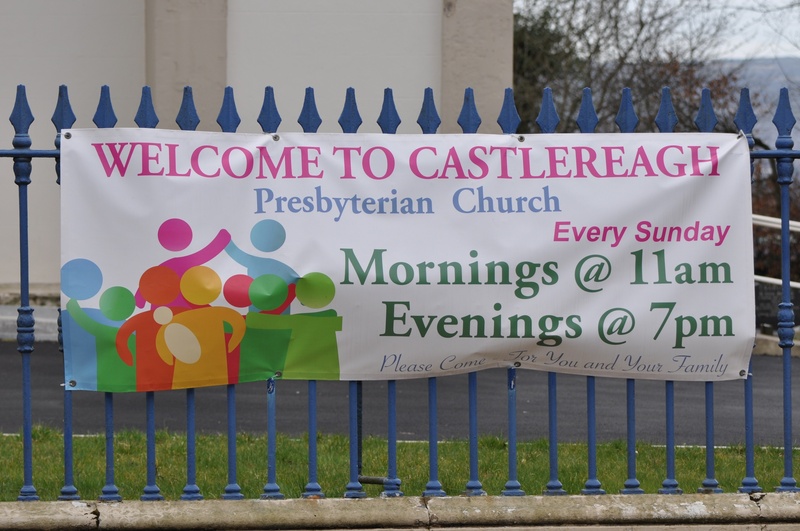 Back home, successive local government bodies have used the name Castlereagh. Three years ago I took this photo in Moneyreagh. 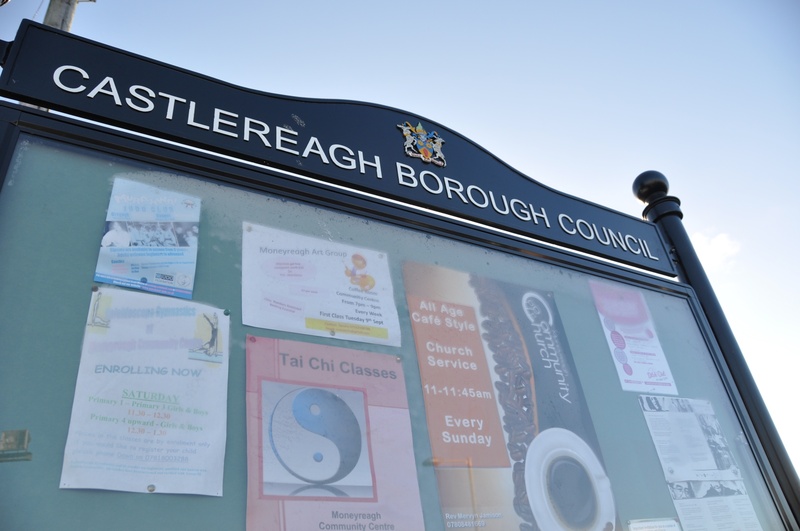 A few months later, Castlereagh Borough Council was abolished. Most of its district was taken over by the new Lisburn and Castlereagh City Council, but oddly enough one of the few places transferred instead to Belfast City Council was the original townland of Castlereagh. The only way I can illustrate this is to show you a picture of a bin! Which brings us to 2018. If there is no grey castle, what dominates the Castlereagh hilltop these days? 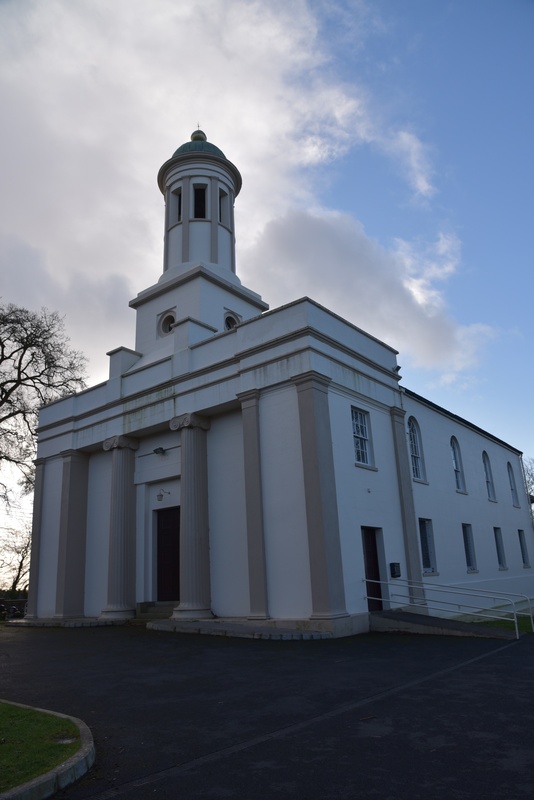 It could be the Presbyterian Church, built in 1835 to replace an earlier building from 1720. 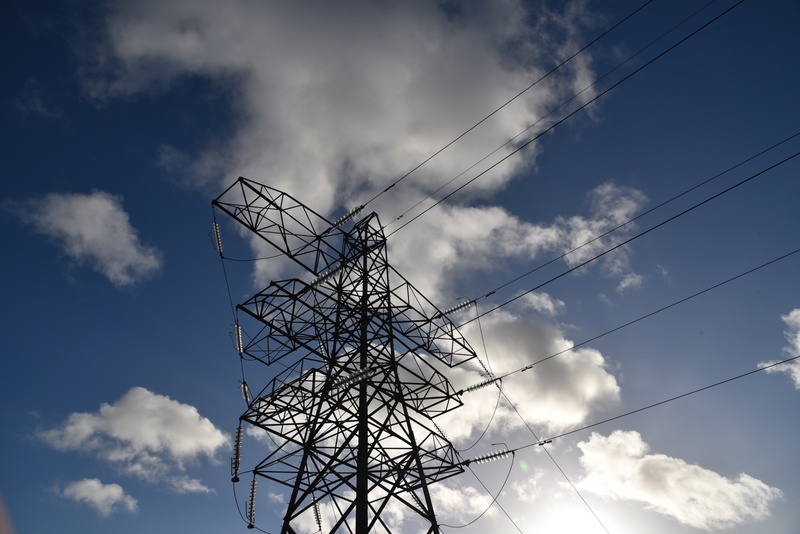 Or the electricity substation on Manse Road. 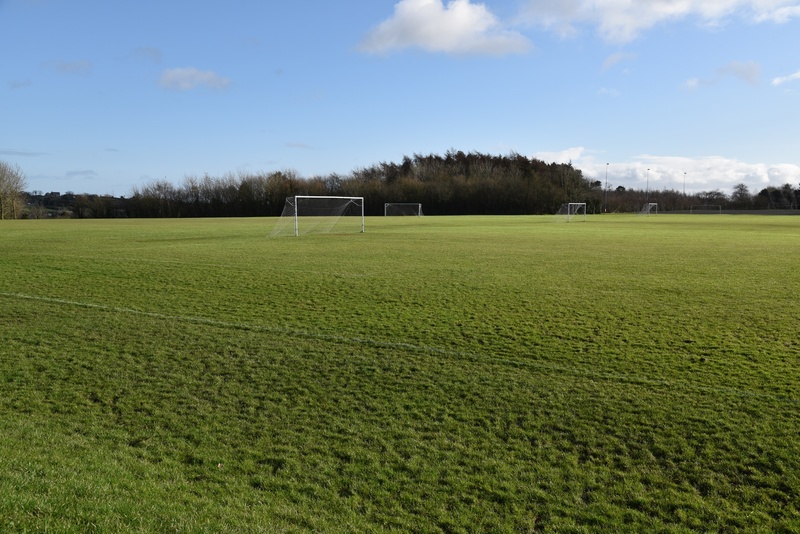 The flattest area at the top of the hill is now the sports ground known as the Henry Jones Playing Fields. Lough View Integrated Primary and Nursery School stands opposite those football pitches. Is the “lough view” name justified? Well, I took this photo a few steps along the road. 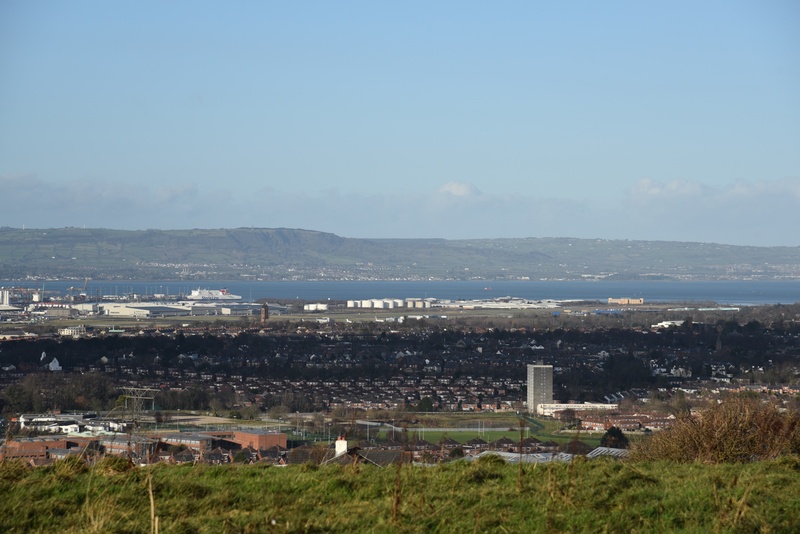 Can you spot the Stena ferry and Belfast City Airport? Or if you are more interested in last week’s townland of Knock, can you pick out the path I followed to the Clarawood block of flats? 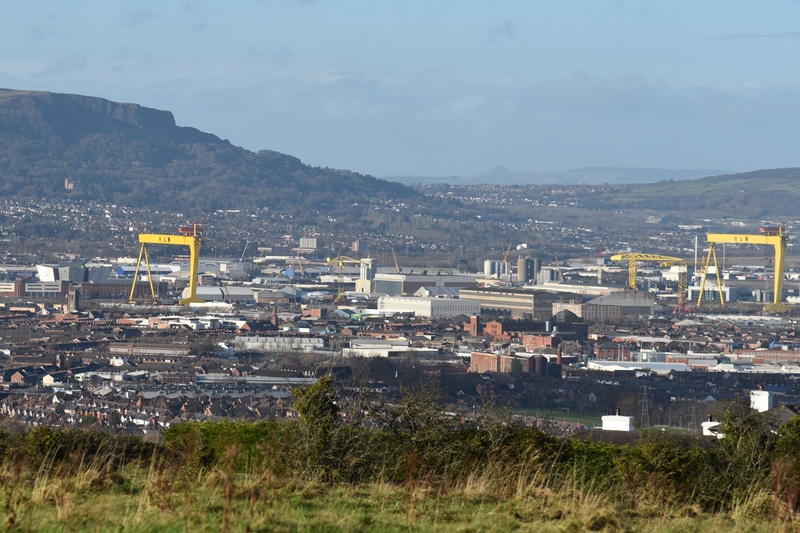 Looking in a slightly different direction, I could see the shipyard cranes, Belfast Castle, Cave Hill, and in the distance in County Antrim, the hill of Slemish. Now that I’ve seen these views, I can absolutely see why one would choose Castlereagh townland as a site for a castle. 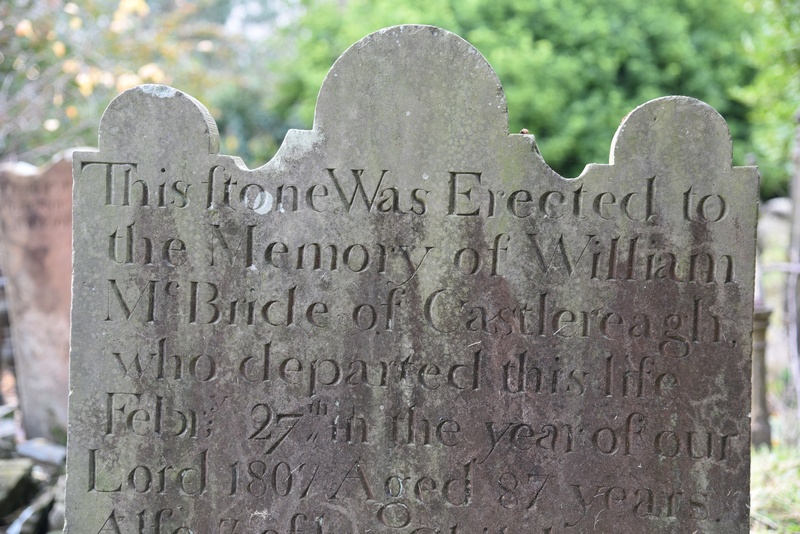 Finally, here is a Castlereagh gravestone from Knock Burial Ground. Which townlands border Castlereagh? To the north, Carnamuck. To the east, Braniel and Slatady. To the south, Lisnabreeny. To the west, Cregagh and Lishnasharragh. Click here for a map of Castlereagh on Townlands.IE. I have an account (somewhere!) of the dismantling of the original castle at Castlereagh – when I next come across that, I will send it on to you. That would be great, Laura. Thanks!